Burlington’s downtown population is set to grow dramatically, but without enough parkland. This reveals another shortcoming with intensification. The mayor and most of council voted on motions that can add 27 high-rises in the downtown. Downtown parkland will be 0.67 hectares per 1,000 people when including existing parks (Spencer Smith Park, Apeldoorn, Brock, Wellington and City Square parks); the hydro corridor, the waterfront vistas at Bridgewater, pathways, and proposals to convert 2 parking lots to parks. That’s much less than other municipalities. Canada’s best mid-sized city deserves a better plan – including reasonable, respectful growth, and sufficient parkland. 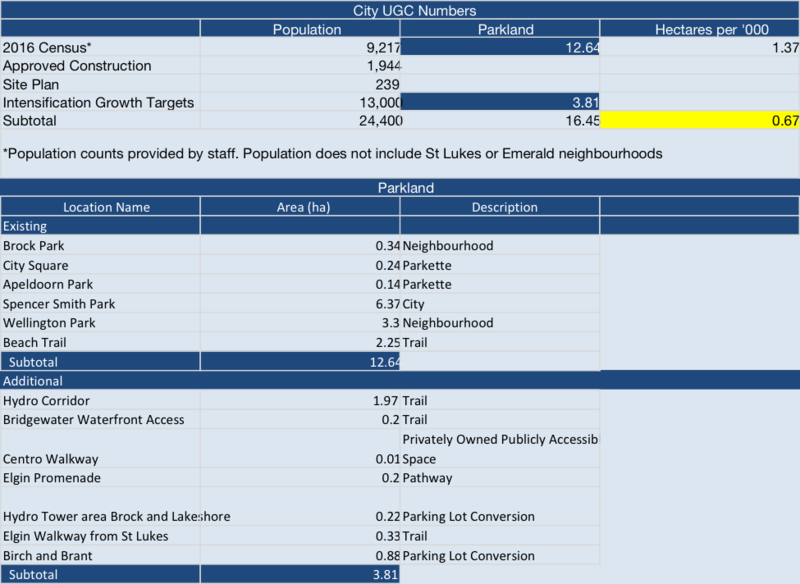 Based on the population numbers provided by staff – summing all parkland in the Urban Growth Centre. Note the population counts do not include the St Luke’s and Emerald neighbourhoods. Expanding the calculation to broader areas in the downtown core, population counts are based on published Stats Can 2016 numbers for 5 census code areas, then adding the staff growth projections to these figures. Marianne, as a candidate for Mayor, what is your plan to COMPLETE New City Park at Kerns & Dundas, on top of escarpment? After the PanAm fiasco that, in the 11th hour, permitted the Feds, PanAmOrg & City Council, to RE-DESIGN that so-called protected ‘UNESCO Biosphere’, allowing the injection of tons of artificial turf & toxic substrates, to what was, initially to be the largest ‘natural parkland area’ in the City, the park is now primarily used as a ‘private’ sports facility by the DOWNTOWN soccer club. Over $6million was ear-marked for that ‘park’. ~ What happened to all those funds? Has the on-going cost of removing & replacing this fake plastic grass for soccer club use in the UNESCO Biosphere been included, in plain text, in the OP, so that future generations of taxpayers know they are on the hook for this short-sighted lunacy every 5-8 years? The ORIGINAL plan for City View Park, designed in collaboration with the Bruce Trail Org, was to include a long needed parking area near the escarpment brow & a look-out platform. Neither of those items has been done. Instead, after scalping the existing landscape to prep for the fake grass fields, a large living-earth dirt mound has been left as a permanent ‘unfinished’ eyesore in the middle of the park. When will this parkland area be FINISHED? It is, frankly, criminal & permanently tragic that this supposed long term ‘Legacy’ park ~ initially intended for ALL Burlingtonians, (not just ‘private soccer clubs’ from the DOWNTOWN core) ~ was hi-jacked and seemingly since abandoned for what was a very short term political PanAm photo-op. If this how existing Council & you (who all unanimously voted to move the Pan Am Games UP to City View Park after downtown’ whined & winced with classic NIMBYism), intend to ‘handle’ City-wide problems, especially when ‘easy’ funds are available, I honestly do not have much faith in local politicians working for the broader Burlington community, (not just vested downtown ‘share-holders’). Until there are RESULTS, with a finished (revised) ‘parkland area’ at City View Park, as PROMISED to the public during Ward 1 bogus ‘public consultations’, why should ANY tax-paying citizen from Burlington ‘buy in’? Sorry, long winded. But this on-going issue still has to be dealt with seriously & properly ~ for future generations. Best plan? Take that toxic crud out of City View Park permanently. Period. Natural grass alternatives are available that need minimum watering. They do not contribute to green house emissions or ‘heat islands’ like the current plastic materials. Take away the ‘privilege’ of the DOWNTOWN soccer team’s semi-exclusive access. Remove the current fences so that ANYONE can ‘play’. Open up the parkland area ~ as it was initially intended & designed ~ to a “natural parkland area” ~ for ALL Burlington taxpayers to enjoy. In other words, create a truly noteworthy Legacy Project. As it stands, Burlington has the global distinction as the only ‘democratic’ municipality that has invested, and maintains, the installation of tons of toxic plastic grass into a UNESCO Biosphere. Not something to be proud of, and certainly not FORWARD-THINKING. I am a big fan of the sound of music festival and ribfest but they are at the carrying capacity for those parks..an accident waiting to happen..spencer Smith is beginning to look like the QEW at 5 pm. Really relaxing. The city intensification tag line definitely changed from “grow bold” to “grow greedy”. Thanks senior staff and most of council for feeding the greed! Thanks for dismissing current resident concerns in such a cavalier way and instead rewarding bad behaviour by developers. Exactly Paul. It doesn’t matter how many committees we form, how many public meetings they hold, how many petitions we sign – council goes ahead and panders to the developers. Our entire council, with one exception IMO (Marianne Meed Ward) should be fired. I’ll support her bid for Mayor if she promises swift and binding changes to this over densification madness. I think it would be a good idea to ask the Liberal and PC candidates in the upcoming provincial election what they and their governments will do to stop the destruction of downtown Burlington. It is tragic that Council has sided with developers to go ahead and build these high raisers and most downtown, shame on you all. More condo square feet than blades of park grassland! You are so right… and about that tree bylaw. OMG! 27 high rises in downtown? From Lake to Caroline and Martha to Locust? Just ponder a moment. Picture the confusion, constriction, conjestion. Resident benefit —–Developer benefit ++++++. City custodians sold the farm. Burlington’s downtown will soon have one of the largest waterfront parks at it’s doorstep. Spencer Smith park was packed today! Not much in the way of space for everyone. Spencer Smith and Beachway are also regional parks, drawing participants from well outside the walkable boundaries. If you count users of the parks, rather than people who live within walking distance, the ratio of people to parks goes down further. I was down by the canal earlier, no problem at that end. The new park is an extension of Spencer Smith park, downtown is fortunate to have it in their community. The fact remains Burlington has no standard while other municipalities do far better. Lynn Crosby That’s a policy council could consider at any time. When I read the headline for this post, “Burlington downtown getting many more people-not enough parks” didn’t make sense with the new Waterfront park and forgetting to consider Lion’s park, Coronation park Wellington park and Central park, all within walking distance of downtown. If more parkland is needed it would likely be in other areas of the city. To many of us the ratio, especially after all the planned builds, is not good enough. As for council considering more green space at any time, the time is when writing the OP. Lynn Crosby I only see the ratio for the downtown in this post and that doesn’t consider the parks I mentioned. The other ratio’s mentioned are city wide. Do you know the ratio city wide, you may be surprised. Lynn Crosby I did a little research regarding the park to people ratio. The city owned 1,472 acres of parkland in 2013, about 595 hectares.At our current population of about 183,000 that works out to about 3.2 hectares per 1,000 people, more parkland per resident that any city mentioned in this article. Doesn’t appear we will have a shortage of parkland for a long time. You’ve missed the point. The video looks forward to what’s coming: significant population growth is coming, moreso to some areas of the city than others, and in these higher growth areas parkland is insufficient. 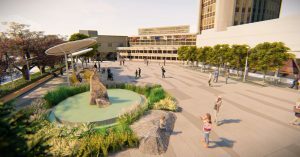 The example provided was the Urban Growth Centre downtown, which will see significant growth without sufficient matching parkland. Additionally, Burlington doesn’t have a parkland per population goal; we should set a target of parkland per population by specific growth area and within a reasonable walking distance (ideally five minutes of less). Burlington’s currently has a parkland to people ratio is about 3.2 hectares per 1,000 people, higher that any city mentioned in this article. With the extension of Spencer Smith park to the canal the downtown will have a park of approximately 35 hectares at it’s doorstep. This one park would provide a parkland to people ratio of 3.5 for a population of 35,000 in the downtown. That is far more residents that the downtown is expected to see in the foreseeable future. John – Missed again. 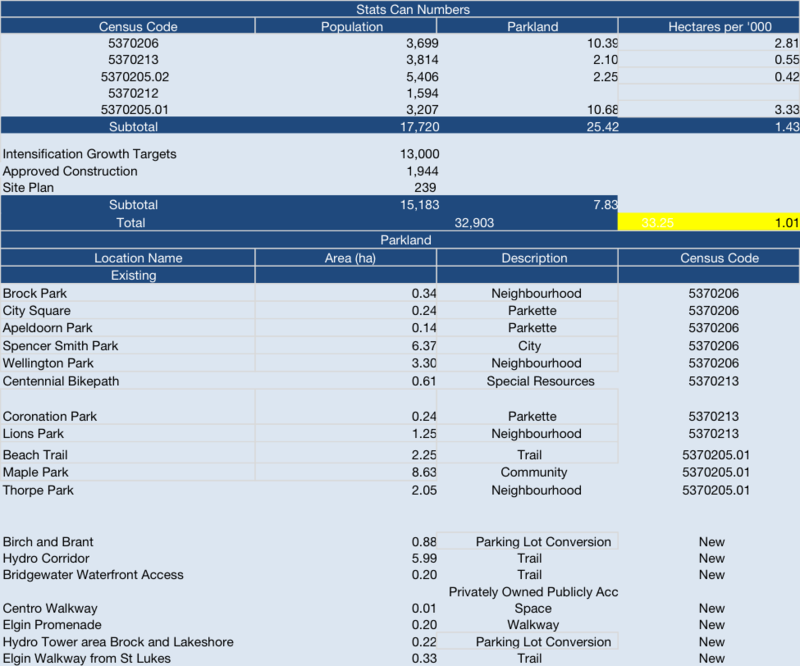 All cities have actual parkland access above their targets. The targets relate to parkland access in close proximity FOR EACH neighbourhood. For example, Mississauga sets a target of 1.2 ha per 1,000 population, within 800m of residential areas. They exclude non-park open areas in their calculation. 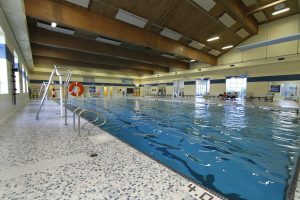 The Beachway park extension is a regional park – well beyond 800m for downtown neighbourhoods – and is not suitable for families with young children. John Was that does seem to be a good number for back in the good days of 2013. Are you able to update your stats and research and add the increased population from all the known developments. My concern even then is what could the numbers be when you add the unknown and future developments. I think there should be something in place to ensure adequate park space. Kerri Murray Vane 595 hectares of parkland would support a population of about 270,000 people and have a 2.2 park to people ration, equivalent to the Oakville mandate. There is no projected population numbers for that amount of growth in the foreseeable future. Unless the city has sold over 192 hectares of parkland in the last 5 years there is no issue. The comparison of the downtown to city wide numbers is not an apples to apples approach. If you just consider the downtown urban growth center you should be comparing to other city’s urban growth centers. I have no doubt you could find examples of neighborhoods in all city’s where the ratio’s are low. The city does consider park land when reviewing every development proposal and can take land or cash in lieu so they can expand or improve existing parks. I can do my own research. None of it changes the point that many of us who live in the downtown do not accept the thousands of new people that will be coming here compared to the small amount of green space in comparison, and the same holds true for the rest of the city, though this article is about the downtown. Expand your view: look at other cities. Look at other downtowns. Look at designs of buildings around the world – yes, sometimes even beautiful 8 storey buildings and see what is possible. Look at cities with gorgeous downtown streetscapes that honour their old buildings and keep a feeling of quaintness. Look at cities that don’t just put the bare minimum of green space but far exceed it. Maybe you are happy with status quo, maybe you are happy to accept and be fed whatever the various stakeholders tell you. Many of us who live here are not. Lynn Crosby I haven’t seen your research however, Burlington as a city doesn’t have a shortage of parkland and won’t for the foreseeable future. I have no doubt that in most city’s you can find examples of neighborhoods where park to people ratios could be improved however, the example of our downtown doesn’t mean we have an issue city wide. City downtown’s come in all shapes and sizes, what appeals to some doesn’t to others. That’s a very different conversation beyond the scope of this article. My personal perspective of the downtown is from my 60 plus year of watching it grow and evolve, look forward to having that conversation.